This is a bit of an essay but I thought I'd document the progression of a manicure over three days wear. 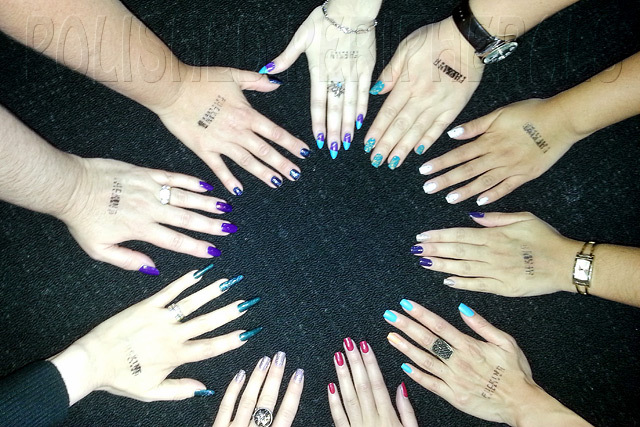 Every so often the Aussie Nails girls in each state have a meet up for lunch, swapping and shopping. Of course the big issue before each meet is what polish to wear. I like to wear Aussie polishes for the occasion but usually run out of time and just slap on whatever is closest at hand and needs the least coats. Mostly that means underwear polish, which is anything that is opaque in one coat and serves as the base colour for some glitter or nail art, but then I run out of time for nail art, meaning I attend these meet ups in my undies :P then dress up the next day. So last meet up we had Yum Cha and I wore this. Sation Miss Emo Shun All. 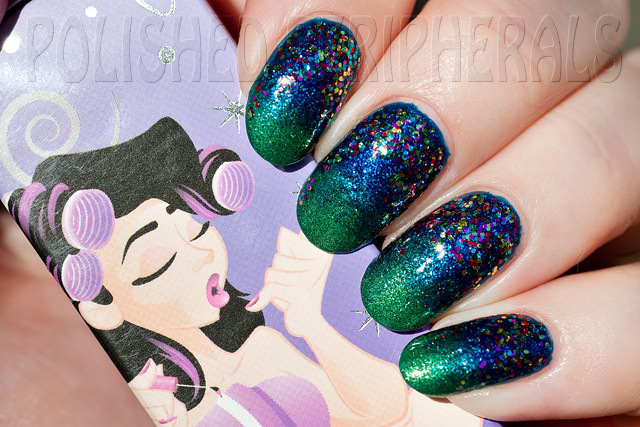 Not Aussie but a gorgeous rich colour that I had planned as underwear for an Aussie indie glitter polish. This sort of purple can be hard to photograph but these photos are true to colour (at least on my monitors). I put this on the day before and intended to finish my mani in the morning before Yum Cha but I woke up to chipped polish and had to add another coat of the Sation to repair the damage then top coat again. Then I had to give it plenty of time to dry so I could wash my hair. That left me with no time for nail art so I quickly added an accent nail of Nfu Oh 51 before heading out. Lunch was fun. We had a table for the girls and another table for a couple of husbands and a bunch of kids which worked out really well because the men were able to 'babysit' for us. At the end we took a traditional group hand shot. This was on the floor of the restaurant so we must have looked pretty strange. When I got home I collapsed but the next day I upgraded my nails with some nail foil. 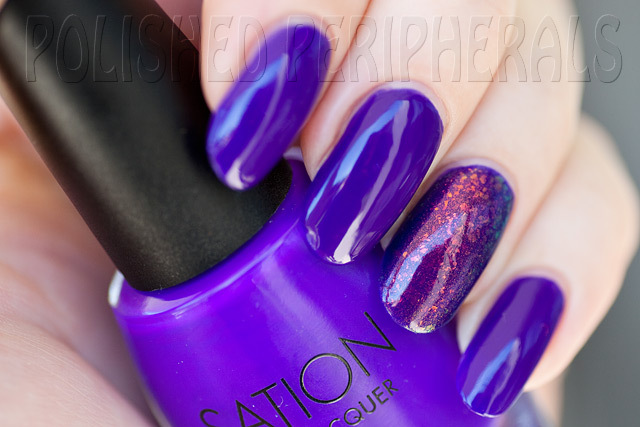 That purple Sation looked like the perfect base coat for some stripey purple holo nail foil I had lying around. 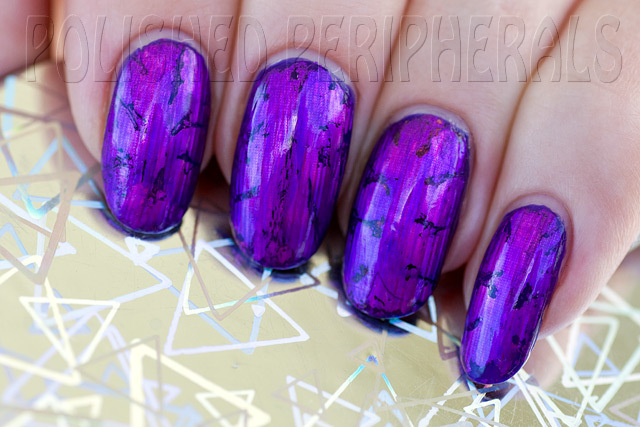 If the base colour is a good match it helps hide any cracks in the foil. In this case I had plenty of cracks. Some of the foil can be tricky to apply over the side curve of my nails and top coat can make the foil wrinkle and crack. In this case it didn't wrinkle too much but the cracks were a pain. From arms length the cracks didn't look to bad and the purple was quite stunning so I wore it for another day before the need for change kicked in and I wanted to try something new. 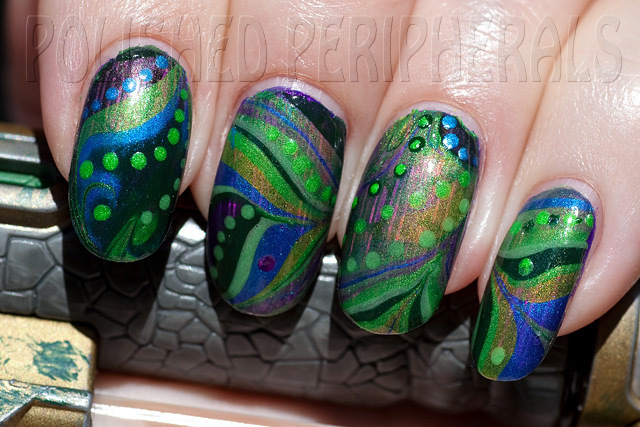 I was keen to have a go at water marbling and thought I might as well try it over the foil before I took it all off. 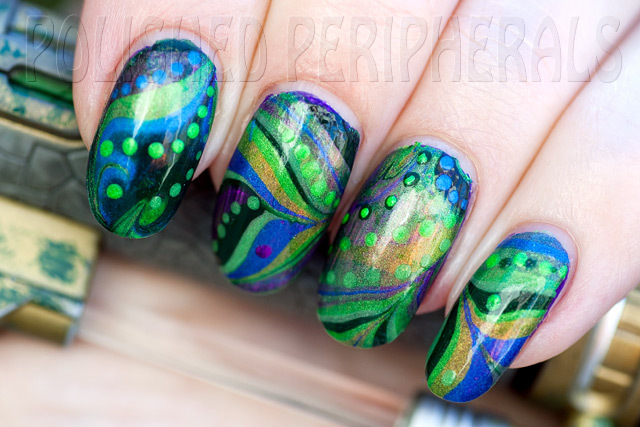 I'd tried marbling it before but never got as far as getting any on my nails, I just hadn't been able to get the polish to spread on the water, but after talking to the girls at lunch I was inspired to give it one more try. This time it worked! The polish spread and I was able to drag patterns in it. I was determined not to make a mess though so I experimented with masking my skin and cuticles before dipping. For the first few nails I painted on PVA peel of base coat around my cuticles and under my nail tips then used painters tape to cover my finger tips. This worked to keep the polish off and I had no need to do any acetone clean up but the PVA went soft when dipped so I had to scratch/scrub soggy PVA out of my cuticles rather than the peeling I'd planned. So I gave up on the PVA and switched to just painters tape for masking. I wish I'd photographed this step but I'll try to explain how I masked. The painters tape is ideal for masking (and tape manicures) because it sticks without being too sticky and peeling off any base polish. It's also wide enough to cover my fingertips. I cut the tape into squares then cut out U shapes. The U shape works for me because my nails are pretty much the same shape and width at either end. I stuck the U's to the underside of my nails to mask under the tips, then stuck the tape with the U shaped holes on the top of my fingers so it covered my cuticles and the long ends of the U's went up the sides of my nails and folded over the tips of my fingers and under my nail tips to hold the U pieces in. I then wrapped more tape around my first knuckles to keep my fingertips clean. It worked perfectly! No clean up needed at all. I just dipped my nails in the water marble then carefully peeled off the tape while the polish was still wet. Here's a photo of my thumb right after removing the tape. It's still wet with polish and water, that's water on my cuticles, and the pattern is a bit of a fail on this one but I wanted a shot to show how clean it is. No clean up needed! I had the tape a bit far over my nail so there's a big bare gap but that's something that I got better at by the time I got to my right hand. I finished up with some dots using a toothpick and added top coat. I like the way the foil showed through in the sun. I guess the tape masking is a lot of work but definitely worth it to me to avoid clean up. If I cut all my tape and lay it out first I can do the actual masking and dipping quite quickly. I was so pleased with the result that water marbling is my new favourite technique and a great way to get a few extra days wear out of a manicure. I just think of it all as a potential base for a marble now. Foiling and marbling after a few days can cover up chips too but I rarely get chips. 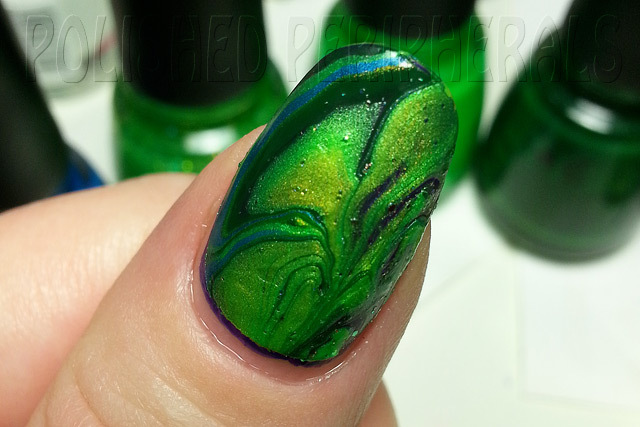 This first water marble success was with all China Glaze polishes. 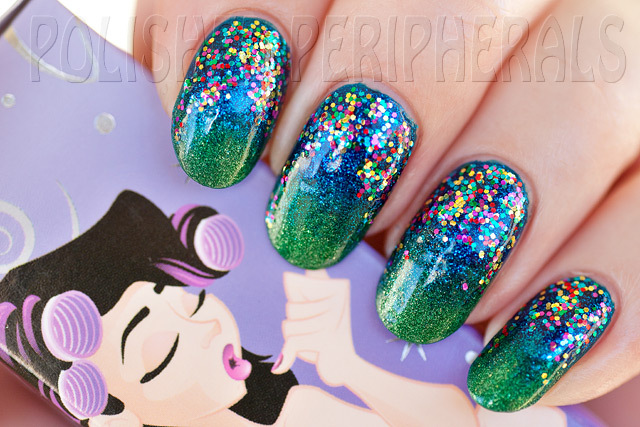 I've since tried other polishes and found most of my Ulta3s and piCture pOlishes work including the piCture pOlishes with scattered holo glitter and the Ozotic multichromes. 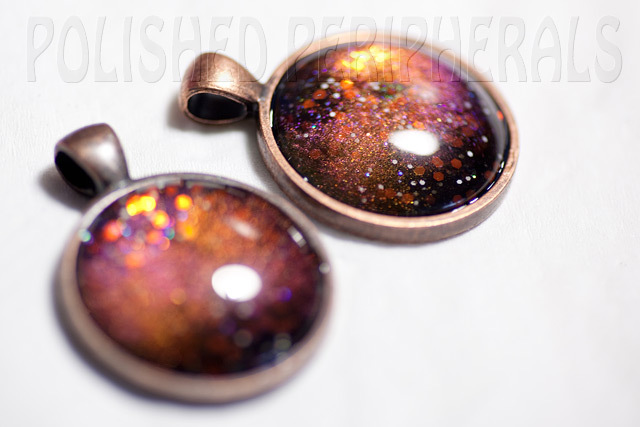 Together over black they make a great galaxy marble effect. 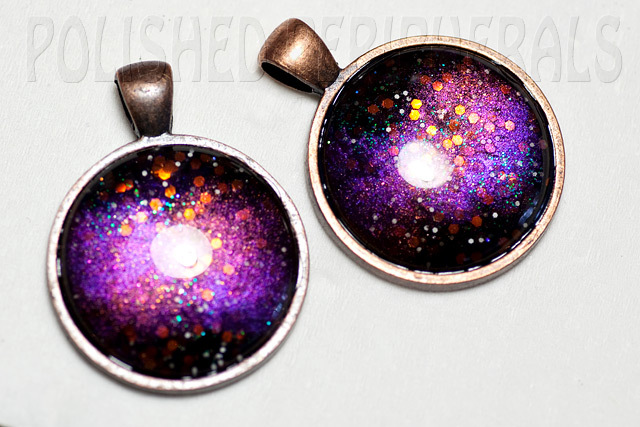 Which reminds me, for our Aussie Nails lunch I wore a galaxy pendant I made, thanks for my 4yo, Ben. I often make nail polish rings for myself and Ben wanted to make himself a ring but none of the adjustable ring blanks I have were small enough for his little fingers. 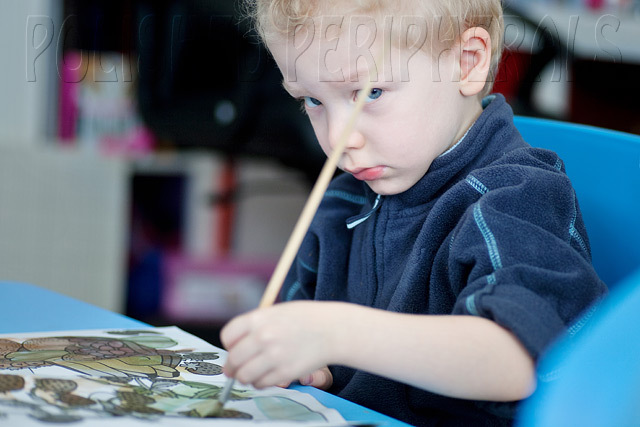 He got the sulks and gave me this look for most of the day until I suggested he make a pendant. I was so impressed with how his pendant turned out I had to make one for myself to wear to lunch. His is the one on the left. The glue is still wet in this photo. He wears his pendant on a ball chain and I used black and brown leather and ribbon to hang mine. It's time for a celebration. A Pretty Serious Celebration! 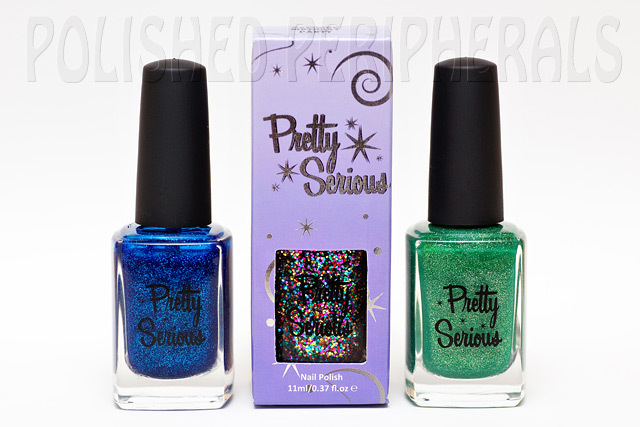 To celebrate Daphne's birthday (and their 1 year anniversary) Pretty Serious have released a special polish called Daphne's Birthday Party. 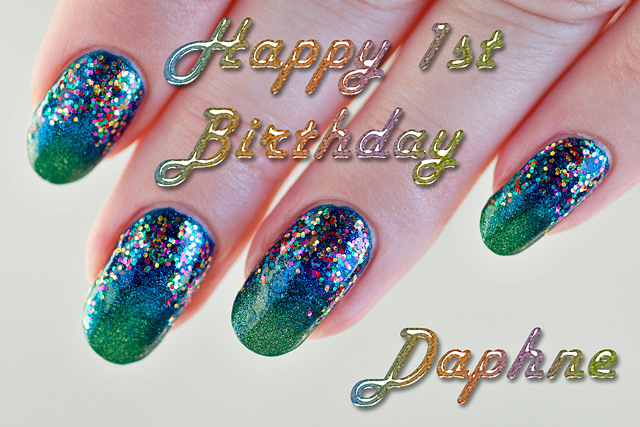 It's packed with 5 different sparkly glitters that are all the same size, like sparkly confetti, and today polish lovers around the globe have been invited to join the celebrations by wearing and sharing Daphne's Birthday Party. It was raining this morning and I was worried I wouldn't get to photograph this in the sun but it turned out to be a beautiful day and this combination was so sparkly it was hard to see the colours of the glitter. In the shade though the blue and green was gorgeous with the glitter colours. This is 2 coats each of BSOD and VT100, blended in the middle with a sponge, and a light brushing of Daphne. All finished with 1 coat of Out the Door top coat. yes I do still have the boxes for the other two.